An agreement reached Tuesday at least temporarily resolves a dispute over 130 provisional ballots that could prove decisive in Arizona's last undecided congressional race. The outcome of southern Arizona’s 2nd Congressional District back-and-forth campaign for the lead between Democratic U.S. Rep. Ron Barber and Republican challenger Martha McSally will decide whether Arizona chooses a Democratic or Republican congressional majority. Today, a full six days after the election, the race had still not been called for either candidate. Barber was leading by 698 votes, or about .25 percentage points. Nearly a week after Election Day, Kyrsten Sinema’s growing lead translated into an official victory in Arizona’s 9th Congressional District. 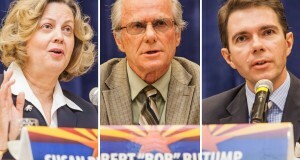 With Sinema leading by 5,789 on Monday morning, the Associated Press called the race for the former state legislator. At the time the AP called the race, Sinema held a 2.7-point lead over Republican nominee Vernon Parker. For the first time since the 1980s, Arizona Democrats had a fighting chance for a U.S. Senate seat. And even though their candidate lost, Democrats are hoping Richard Carmona’s candidacy is a sign of a better future for them in Arizona, where Republicans have dominated for decades. Despite facing virtually no opposition, Proposition 116, an initiative to dramatically lower the property taxes that Arizona businesses pay on equipment, was rejected by voters. Shortly after noon on Election Day, Paul Garrett walked into his polling place in Mesa, ready to cast his vote. But when he got into line and told the poll worker his name, he was advised that he had already received his early ballot in the mail, so he would have to cast a provisional ballot. By all appearances, Democrat Ann Kirkpatrick has won the race to represent Arizona’s expansive 1st Congressional District. Her Republican opponent, Jonathan Paton, however, has not conceded, saying that he is waiting to see how the uncounted ballots may affect the outcome.